1. Tinkler, complete, silver, 23 x 11.4 mm, punctate pattern. 2. Pendant, complete, silver, 17 x 15.8 mm, oxidation on surface. 3. Brooch, complete, silver, 13 mm. 4. Pendant, complete, silver, 15.8 x 5.6 mm. 5. Tinkler, complete, silver, 19 x 5.1 mm. 6. Earring with ball, complete, silver, 17.4 mm. Researchers at the Center for Archaeological Research, Missouri State University have accumulated over 226 document files in 37 folders and over 6,000 artifacts from sites associated with the early nineteenth—century Delaware occupation of the James River in southwest Missouri. These materials provide information important to an understanding of early reservation-era settlement patterns and economy. James River flood plain in Delaware Town area. Flood plain looking toward the James River. Fur traders William Gillis and James Wilson lived and worked among the Delaware on the James River. Gillis was connected with the trading house of Menard and Valle in Ste. Genevieve. Pierre Menard, a principal of the firm, was an Indian subagent for the fledgling Department of Indian Affairs and visited the Delaware at their villages on the James River. Gillis established a trading post somewhere near Anderson’s village to provide the Delaware with needed supplies. James Wilson traveled with the Delaware from Indiana to Missouri and served as an interpreter. He was eventually relieved of his government duties and established a fur trading post near the confluence of the James River and his namesake, Wilson Creek. The Delaware were firmly entrenched in the fur trade at the time, receiving most of their goods from trading houses in Kaskaskia, Ste. Genevieve, and other eastern cities. During this phase of the fur trade era, traders were required to hold a government license to trade with native peoples. It was thought that this type of governmental control over trading activities would lessen dishonest practices. Though paternalistic in nature, the idea of licensure was to protect native groups from those traders who would take advantage of their Indian patronage. However, Gillis operated without a license, which became a repeated topic of correspondence between the Department of Indian Affairs and Indian Subagent John Campbell, who also lived among the Delaware on the James River. CAR archaeologists and other historians have been actively studying this section of the James River valley since 1999. Over the past five years, CAR has identified at least four sites dating to the Delaware occupation of the area (A.D. 1822-1830). Based on historic accounts that describe Delaware lifeways and material culture, the artifacts and features from these sites are consistent with Delaware ethnicity during that time period. The Delaware practiced agriculture, growing crops of corn and raising pigs, in addition to hunting and gathering. Two sites along the James River appear to be representative of the core of Delaware occupation in this region. Sites 23CN1 and 23CN455 are situated on a deflated Pleistocene terrace below a relatively steep sloping ridge. The Delaware Town site (23CN1), the first site recorded for all of Christian County, was originally described as a prehistoric Late Archaic and Woodland site. Over the years, it has yielded a wealth of prehistoric artifacts, including a wide variety of projectile points such as Table Rock, Kings, Reed, Scallorn, and many others. It wasn’t until 1999 that the site was revisited and the historic component was identified. Limited excavations were undertaken at 23CN1 by Missouri State University’s archaeological field schools in 2004 and 2005. Systematic metal detecting served to assist in targeting the locations of excavations. A rectangular feature (Feature 2) that measured 3—x—5 m (10-x-16 ft) was encountered during the 2004 fieldwork and excavations were resumed at the location of this feature in 2005. The feature fill was a gray silty clay loam that contained charcoal and burned clay. It was relatively darker than the surrounding soil matrix. The 2004 fieldwork also revealed several small circular features in close proximity to Feature 2, as well as a pit feature. The small circular features likely represented the locations of holes in which structural posts once stood, whereas the pit feature extended below the floor of structural Feature 2. In 2005, an additional post hole and a large ash-laden area were identified and excavated. All of the features observed in 2004 and 2005 are consistent with the structural plan of a dog-trot or double-pen cabin that likely contained a hearth. 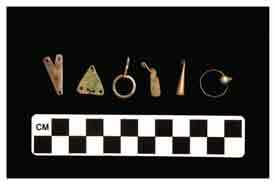 Some of the recovered materials include silver tinkle cones, jewelry, glass beads, iron cones, an iron horseshoe, an iron fishhook, a pair of scissors, British gunflints, and square cut nails. Although the site has been plowed and prehistoric materials were encountered, it was evident that some features and materials remain intact below the plowzone, which extends to a maximum depth of about 30 cm below the surface. Metal detection at 23CN455 in 2005 yielded a dense concentration of iron objects and smelting wastes. It is possible that site 23CN455 represents the location of the Delaware blacksmith. Documents show that James Pool was the blacksmith at the James Fork trading post. He was hired by the Federal Government. He left the southwest Missouri in 1830, moving to the Kansas City area with the Delaware.